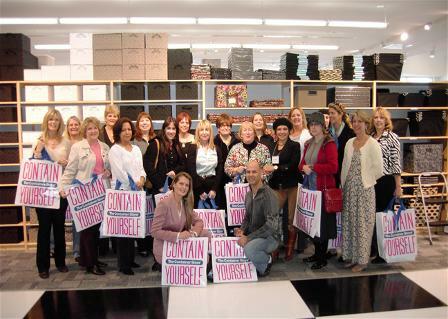 The Container Store held a private event for the members of the NAPO-South Florida Chapter at their newest store at The Village of Gulfstream Park in Hallandale Beach. We had a great turnout of both active and associate members. Audrey Robertson, PR Director, provided interesting background on The Container Store as well as a guided tour of their newest location. Goody bags for all and prize drawings highlighted the morning. A number of the members returned that evening for the Grand Opening Private Party attended by hundreds of guests. Great food and music insured a wonderful time for everyone. Several members were photographed during the festivities for The Container Store’s newsletter.